From its modest inception in 1999, Alibaba has now become one of the biggest e-commerce sites in the world. 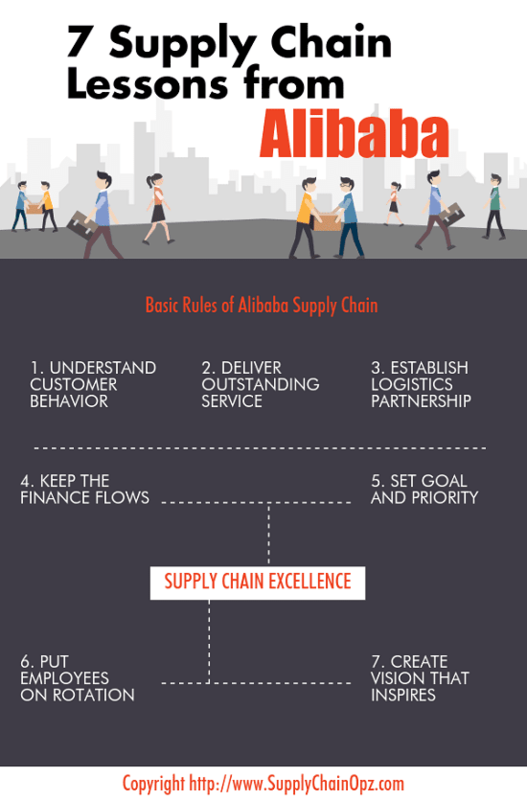 In this article, we will show you 7 supply chain lessons of Alibaba. Many people think the success of Alibaba is derived from the fact that China is one of the biggest economies on the planet with the population over 1.411 billion people (and about 400 million people are already their customers.) In our opinion, there is something more than that. Let's check out what we think Alibaba's secret sauce is. Many people believe the advantage of Alibaba group is that they don't carry inventory. We think a coin has two sides. You can save a lot of cost of capital by not holding inventory but you won't be able to be responsive to customer demand either. Then, it's just a matter of a different business model and it depends on how you execute this strategy. In the case of Alibaba, they understand customer buying behavior clearly. They know for the fact that Chinese customers just LOVE the price bargaining. So, Alibaba creates an environment that customers can shop the way they always do in real life. They build a chat application that customers will feel good by asking for some discounts from vendors. Another success factor of Alibaba is called “Xiaoer.” Xiaoer is literally a team of customer service representatives who have the power to mediate any disputes. They also have the authority to manage and control vendor's performance and invite top performing vendors to participate in the new marketing campaigns. China is a big country and some parts are less developed than the others. In order to serve customers in as many areas as possible, Alibaba relies on third party logistics providers. At first, Alibaba uses private couriers for in-service areas and China Post for countryside delivery. When Alibaba realize that the expansion of the network is required, they establish the company called "Cainiao." Cainiao is actually not an in-house logistics arm but it behaves like a fourth party logistics provider. They use a data integration platform that links every 3pl companies together without investing in any physical infrastructure. Financial flow is one of three major elements of the supply chain. Without reliable payment, the company can't operate smoothly and products won't move. Alibaba establishes the escrow system called "Alipay" to ensure that customers will get products they order and vendors will get money when they deliver. While many companies in the United States are results-driven, Alibaba has a different perspective. Even though high performing employees are constantly rewarded with many cool perks, Alibaba encourages its employee to set the realistic goal and break down the process so they can get some results every day. Morning briefing and the after-work meeting is the way to explain what to do and lesson learned each day. Alibaba encourages its employees to rotate work between each business unit and branch quite frequently. Doing this way, each employee will have more understanding of the overall business process. So they will be able to coordinate with each department much better. "Leaders make sure people not only see the vision, they live and breathe it." Jack Ma creates his own version of vision the way Jack Welch does and call it "Spirit Sword." It's basically the Mission, Vision, and Values that every Alibaba's employees should follow. Are these lessons from Alibaba something you can use? - Clark, D. (2018). Alibaba: The house that Jack Ma built.